Below is a selection of off camera flash at Parkanaur Manor and some discussion about lighting. Parkanaur Manor House is a location I use regularly for off camera flash photography workshops with small groups of photographers. This time though I wanted to revisit the location with just a model and myself. I wanted to try new lighting and explore new setups to introduce into future workshops. The photos below are in the order taken on the afternoon. Thanks to Grace for modelling. The Library Room was our starting point for the afternoon. I had asked Grace ahead of time to bring her glasses as I wanted to create quite a studious look and mood. Grace sat atop the table while I set about establishing my exposure. I wanted to use my Fujinon 56mm f1.2 lens here to create a very shallow depth of field. With the aperture set at f1.2, that left a shutter speed of 80th/sec. and iso200 to render the background how I wanted it. An off camera flash was then introduced on camera left with a soft box added. With an aperture of f1.2 and iso of 200, the flash power was minimal. Shutter speed was irrelevant for the flash settings. I explain this in a lot more detail on workshops. Sticking with the exact same location, but this time I changed from 56mm to 16mm lens choice. A quick rearranging of the tables and a change back to 56mm for this one. This was using the left hand wall in the Library Room as a background. This now meant the large window was on camera left. Exposure and flash settings remained as above. Again, as with the first setup, I changed from 56mm to 16mm for this one for a wider view taking in more of the surroundings. We then moved into the Piano Room. It was a very dull January, late afternoon. The quality of light in the room was very flat, and the quantity of light was very poor. The top half of the photo above gives an idea of how the natural light in the room was exposing in camera. Big advantages of using off camera flash are the ability to create directional light, and improve the quality and quantity of light. Here I went outside and placed a speedlight on the lawn, carefully positioning its direction and elevation into the room. 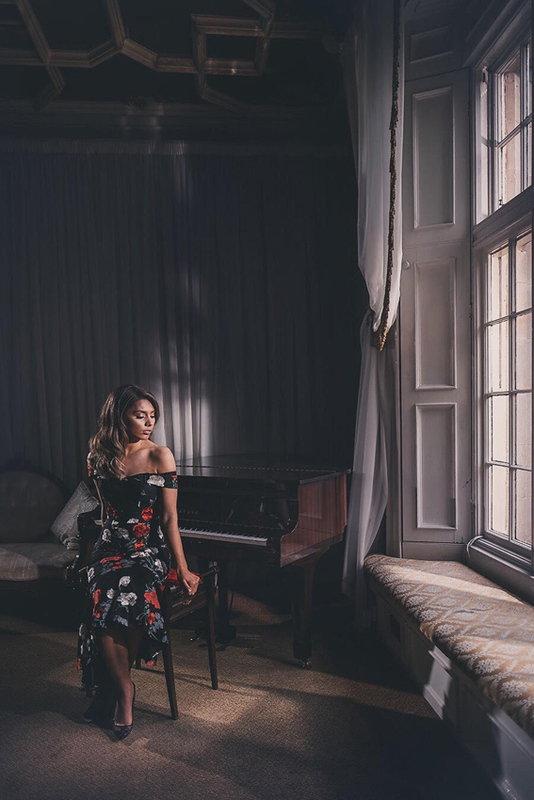 This not only gave a pleasing directional light on Grace, but also created a nice pattern of the window frame on the large curtain background behind the piano. I also added a speedlight camera left to backlight Grace from the opposite side to the window, and to prevent everything camera left from dropping into deep shadow. Lighting on this is exactly as above. No flashes for this one, instead using natural light from the large window. A reflector was added in the room to lift the shadow side and even out the contrast a little. This was our final setup of the afternoon. Window light from camera left and off camera flash from camera right. I hope to be running an off camera flash day at Parkanaur Manor House on 17th February when we will be covering the above setups and more. It will be a mix of indoor, low light and outdoor location setups, using mainly off camera flash with some natural light also. The day will be running from 11am to 5pm and a cost of £95. If you would like to book then please get in touch here. Nigel Fleming Photography is based in Dungannon, Northern Ireland, and offers a range of photography workshops and courses. These range from photography studio lighting, location off camera flash speed lights, and Adobe Lightroom workflow and photo editing. Workshops and courses are in small groups, and are also offered on a one to one basis. Please contact us for more information.